Newfoundland and Labrador has a world class geology. 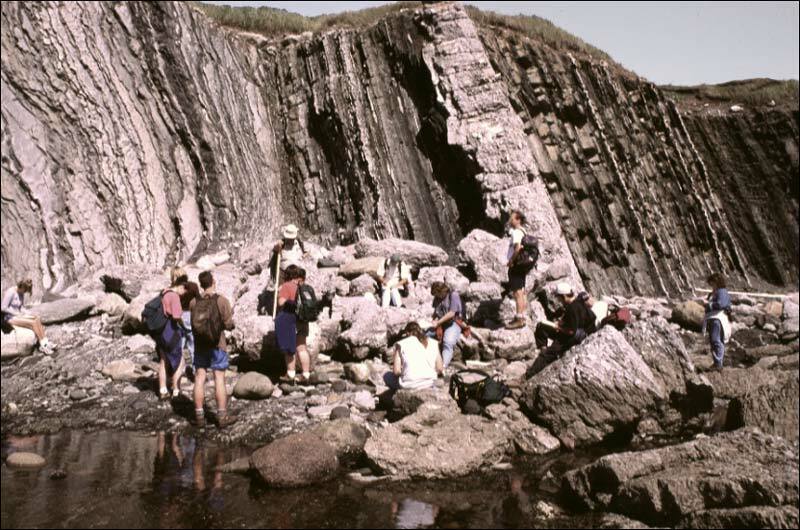 Earth scientists from all over the globe visit the province to study the record of the earth's evolution preserved in its rocks. Not only does it have some of the oldest rocks in the world, but it also has some unusual sequences of rocks which tell a fascinating tale of colliding continents and disappearing oceans in the geological past. Gros Morne National Park, in western Newfoundland, was declared an UNESCO World Heritage site in 1987 to recognize and preserve its unique geological landscape which has been described as the 8th Wonder of the World. Gros Morne National Park is a breathless landscape of fjords, seacoast, forest and mountains, but it was its geology that led to the area's designation as a World Heritage Site in 1987. The mineral resources of Newfoundland and Labrador are a direct product of its geological history. The discovery of a major ore deposit at Voisey's Bay, Labrador, in 1993 and the successful development of the Hibernia offshore oil field highlight a long tradition of mining and resource use dating back to prehistoric time when the Maritime Archaic Indians quarried Ramah chert in northern Labrador and traded it throughout the Atlantic provinces and states. The Earth's solid surface is a restless jigsaw of abutting, diverging, and colliding slabs called tectonic plates. How plates behave forms the subject known as plate tectonics. It is an important key to understanding why continents collided in ancient Newfoundland and Labrador. A slice through the Earth reveals a layered structure: a central metallic core surrounded by a thick mantle and a thin outer crust. Cut open like a cake, today's Earth would show this layered structure. Scientists deduce its inner layers from how these interfere with waves set off by earthquakes. From Stephen Colman-Sadd and Susan A. Scott, Newfoundland and Labrador: Traveller's Guide to the Geology. (St. John's: Government of Newfoundland and Labrador, 1994). The mantle is solid, but over very long periods of time most of it behaves like plasticine and flows. The temperature difference between the top and bottom of the mantle causes a circular flow called convection. The uppermost mantle and crust form an outer shell of rigid plates. The plates, and the continents they contain, move across the Earth's surface on the convection currents. Surrounding the Earth's core is the mantle, a 3,000 km thick layer of dense magnesium- and iron-rich rock called peridotite. Heat generated by radioactive decay and gravitational friction keeps part of the mantle soft. Convection currents stir this semi-fluid layer. Molten rock (magma) rises towards the surface of the Earth, cools, and sinks to be reheated far below. On a smaller scale, convection currents can be seen in a cup of hot coffee as milk warms and wells upwards in billows, then cools and sinks again. Plates grow by the addition of new rock from the mantle at mid-ocean ridges, where the convection currents rise. The volcanic island of Iceland sits on top of the Atlantic mid-ocean ridge. Plates are destroyed when they are carried down into the mantle at subduction zones, such as the one off the coast of British Columbia. In some places, the plates simply slide past each other along huge faults, like the San Andreas Fault in California. Modern plate movements have parallels in the distant past when the same processes built the Island of Newfoundland. At mid-ocean ridges, rising convection currents melt mantle rock to form magma, which then collects in magma chambers beneath the ridges. Currents in the soft mantle are powerful enough to crack Earth's crust into enormous plates. As the plates separate, molten rock wells into the expanding rift, then cools and hardens into new oceanic crust. At present there are about twenty plates of different sizes and shapes moving about the surface of the planet. Some underlie ocean, while others underlie ocean and continent. Driven by convection currents in the mantle, plates can move at the dizzying speed of ten centimetres a year. Movement in the mantle cracks the overlying crust, allowing the magma to escape and build volcanoes on the sea floor. Each time the crust cracks, the rocks on either side of the ridge are moved a small distance sideways to make room for the new volcanic rock. Repeated cracking gradually moves old volcanoes away from the hot, active ridge area, and they become buried under layers of sediment. When a plate descends into the mantle at a subduction zone, part of it melts in the hot interior of the Earth. The melted rock erupts on the surface as a line of volcanoes. When plate edges override one another, one of the plates is forced down into the hot mantle and melts. This process is called subduction. Molten crust material is lighter than mantle, and it rises - melting its way through the overlying solid rock and erupting as volcanic lava. When a continental plate collides with an oceanic plate, the dense oceanic plate is usually forced underneath the lighter continental plate. Continents therefore endure by floating on the surface of the mantle, but ocean crust is consumed by subduction. Because ocean floor is continuously created at mid-ocean spreading centres, it is far younger than most continental rock. The oldest continental rocks in Newfoundland and Labrador are 3,800 million years old, but the oldest rocks in the ocean are only 150 million years old. If subduction is at the edge of a continent, the volcanoes form mountains; Mount St. Helens in the northwest United States is an example. If the subduction is far from a continent, the result is a chain of volcanic islands, known as an island-arc. Many of the islands in the Caribbean and the western Pacific Ocean were formed in this way. Ocean crust and mantle are easily subducted because they are made of heavy basalt, gabbro and ultramafic rock, which "sink" into the mantle. Continent crust, however, is made of lighter rocks like granite and it "floats" on the mantle, instead of being subducted. When continents collide, rocks are crumpled into great folds and large slabs of crust are pushed on top of each other to form mountains. The Himalayas were built during the past 60 million years by the collision of India and the rest of Asia. The Appalachian Mountain system, which extends into the island of Newfoundland, was formed in a similar way 400 million years ago, but it has since been worn down by erosion. © Trevor Bell and David Liverman. Adapted from Stephen Colman-Sadd and Susan A. Scott, 1994, "Newfoundland and Labrador: Traveller's Guide to the Geology." For other related articles view the Natural Environment Table of Contents Landscape section.